During this era, most issues featured a back-up story. Dr. 13, a.k.a. the Ghost-Breaker, would star in many of them, and his character would often appear as well in the main Phantom Stranger story. Another backup story was the Spawn of Frankenstein, a then-modern retelling of the Frankenstein story written by Marv Wolfman with art by Mike Kaluta. In the final year of the title, the backup story was occupied by Black Orchid, but those stories are not collected in this Showcase Presents volume. If you like this volume, try: tracking down old episodes of Alfred Hitchcock Presents via DVD or HULU. At the start of each episode, Hitchcock would introduce a story, dropping a joke or two, and a make a vague reference to the story you were about to see. At the conclusion, Hitchcock would return to wrap things up nice and neat. Rod Serling would later follow a similar format with The Twilight Zone. It’s easy to see how this format bled over into comic books, as the Phantom Stranger would often introduce the stories, then fade into the background until the very end to help wrap the story up. This entry was posted in DC Showcase Presents, The Phantom Stranger and tagged Jim Aparo, Len Wein, Paul Levitz, Phantom Stranger. Bookmark the permalink. 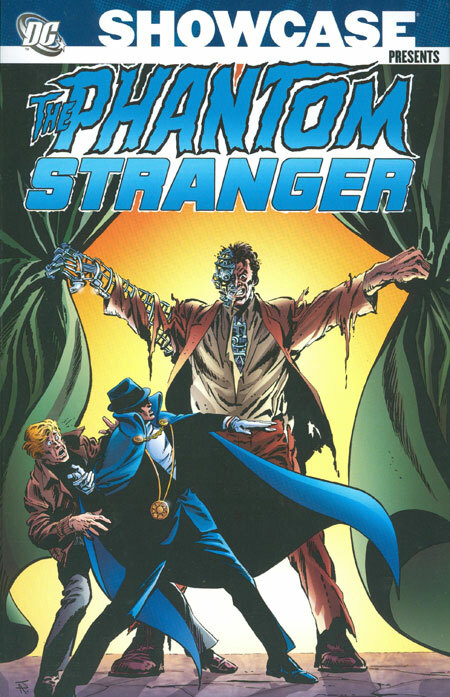 Pingback: Throwback Thursday – Showcase Presents The Phantom Stranger Vol. 2 – WORST. COMIC. PODCAST. EVER!